Twitter is my favorite social network for promoting contents. It can generate guaranteed results if you are using it in proper and efficient manner. The success of a tweet depends on when to tweet and how to tweet principle. Analyze your followers, know at what time they are more active on the social site. Schedule your tweets according to the peak time to ensure maximum engagement with them. Don’t forget to insert relevant hashtags to get visits from the people of specific interests and Twitter search. Followers strength is another major factor that influences your social media engagement. A reliable active follower will respond to your tweets, favorites, or retweet at a certain moment. But there’re several people on social media who are just interested in increasing their fan base and nothing else. I came across several Twitter users who follow me one day and after getting follow back, they will start unfollowing me. Thus they can keep a good difference in between people they follow and people following them. But I regularly use some third party tools to find and unfollow those unfollowers. In this post, we’ll show you 6 best free tools to manage followers and unfollowers on Twitter. Crowdfire is a popular tool in the category. In several ways, it helps you to manage the Twitter followers. Non-Followers tab lets you know who is not following you back and Recent Unfollowers tab displays the list of people who unfollowed you recently. Just tap the red color button on the right side to unfollow the account or mouse hover the Twitter username until it displays a hand cursor icon. Now you can open the connected Twitter profile in a new tab. Just tap the red color button on the right side to unfollow the account or mouse hover the Twitter username until it displays a hand cursor icon. Now you can open the connected Twitter profile in a new tab. Unfollow the account if it’s really not valuable for you. Recent Followers tab shows your recent followers with an option to follow them back in one click. Inactive Following is another interesting feature of Crowdfire. It lets you find users inactive for 1 month, 3 months, 6 months and above. Copy Followers and Keyword Followers are remaining main parts of the tool. They can be utilized to find new followers based on your competitors, keywords, and location. Finding people with similar interests is a great method to build relationships and expand your social media network. Crowdfire allows you to send an automatic message to your new Twitter followers through Auto DM option. Enter your message and save. The app will do the rest. Do you want to check the relationship between two user accounts? Visit Friend Check menu from the left pane, enter usernames of both accounts and hit Check. 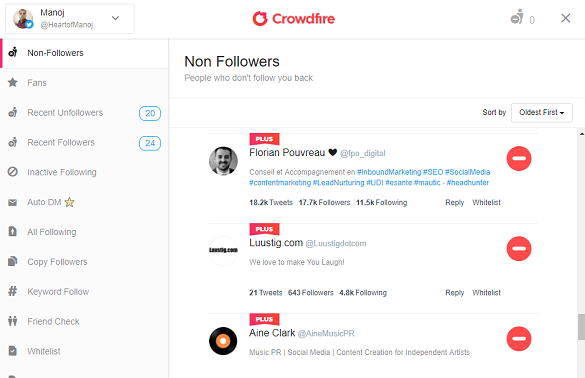 Crowdfire will tell you whether they are following each other or not. 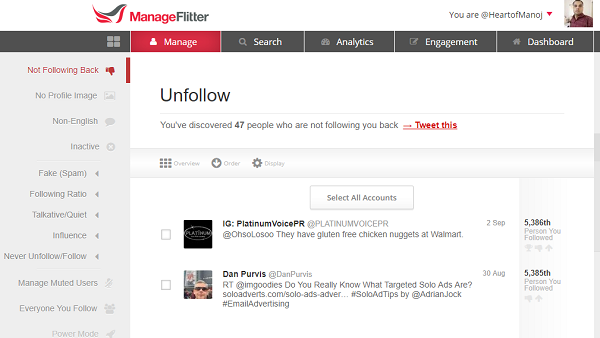 ManageFlitter is another free tool to identify your non-followers. It will sort the list in the order of tweets, following order, influence, activity, and others. 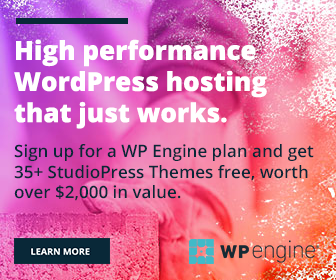 It comes with a simple interface and exciting features to make your community more productive. ManageFlitter will dig into your network & point out fake, inactive, non-English and no profile image accounts that you follow. The app gives many valuable insights to better manage your Twitter account. Commun.it is the perfect place to monitor activities and manage accounts on Facebook, Twitter, and Instagram. It provides powerful insights on social media posts and displays your top influencers for the period. Social media feed is ideal to get real-time updates of your social media community. With Commun.it, you can schedule and send posts at the best time to share. It also showcases the list of your recent followers, unfollowers and non-followers. Go through the each profile, check their followers’ strength, analyze your mutual engagement level and follow or unfollow them if they deserve the same. Commun.it will track your Twitter audience and suggest you follow or unfollow them based on the quality they deliver. The app is an excellent asset for the micro blogging site users. It will note down the accounts who mentioned you and suggests you respond to high-value members. This process helps you to expand the Twitter community and engage the readers. Tweepi is useful to quickly check the users you follow and the users you are not following back. But unfortunately, unfollowers’ list is a premium feature in Tweepi. But still, you can confirm whether a person follows you or not via your following list. If the user follows you back, Tweepi will list your relationship as mutual friendship. Otherwise, it will just mention as you are following. Statusbrew has refreshing design and a beautiful layout. It will let you know the details of a user account in a quick look including their number of followers, following, tweets, last tweeted time, and location. It comes with detailed lists of your following, followers, unfollowers, non-followers, and others. You can filter the users according to various factors like followers count, account age, verified users, time zone, tweets per day and so on. Audiense is another interesting app that I recently came across with. It is a premium tool & mainly focuses on social media monitoring and Twitter management with some unique features. It lets you browse your recent followers, unfollowers, people not following back etc. You can filter the results based on various factors like date last tweet, date you followed, date they followed, influence rate, geographical location, language, profile type and so on. In my opinion, it’s the most efficient tool for managing your Twitter unfollowers that offers several ways to search and find any Twitter account you want. Audiense has a clean, beautiful interface that will make you addictive to the app. Turn on Follow mode to quickly identify the people you follow and reciprocal follows. Which is your favorite tool to manage your Twitter followers? Feel free to share your thoughts through the comments section.